Many elements are included in the creation of your corporate identity system: your logo, specific typestyles and configurations, additional graphic elements, a specific photographic or illustrative style, a company slogan (or tag line), a corporate voice (writing style), and a corporate color palette. 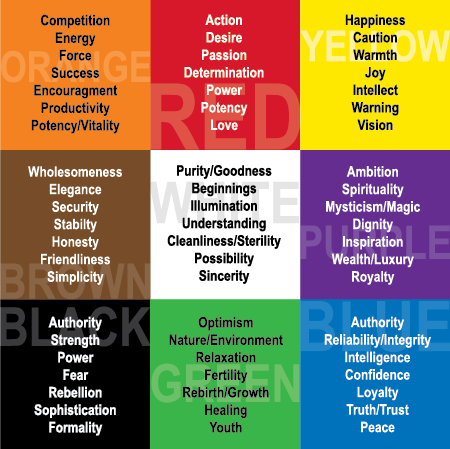 Of all of these elements, one of the most difficult (and subjective) choices your will make is your color palette. What is your company’s personality? Are you serious and all-business? Down-to-earth? Sophisticated, yet fun? Cutting edge? Timelessly trendy? Conservative? If you have competitors, what colors are they using? You’ll want your color palette to be unique so that you’ll stand apart visually. Who are your target customers and how do you want them to perceive and experience your brand? If your audience is younger, pick bright or unusual color combinations that would appeal to them. Older and more conservative audiences respond better to traditional color palettes. What feelings would you like your product or service to express? Your color palette should convey the energy and emotions of your business. A high-energy business would be likely to go with bright or neon colors. A conservative business—like an accounting firm or law firm—might go with muted colors. What colors do you enjoy? While this is not the most important factor, it’s your company and you’re going to have to live and work with these colors more than anyone; the color palette should make you happy. Selecting colors you’re comfortable with can reveal your character and the character of your business. What colors best represent your industry? For example, green is a great color for a lawn care service, but not for a bakery. If you are considering a particular color, write down all of the things in your industry that the color represents. If you can’t think of anything, then that color may not be a good choice. Know the different methods by which you will be marketing and promoting your company. This will help you select a corporate color palette that will translate across all mediums and can be consistently reproduced in a variety of color profiles and file formats. Not all colors can be translated exactly in all profiles. A professional design firm or creative services company will do the research and present you with a consistent color palette that meets your delivery requirements. PMS is used for exact matched solid color printing. Most companies have one or two main colors. Many producers of specialty items, exhibits, and point of purchase displays often ask for the PMS color to match to when they are producing materials. The color is represented by a three or four digit number. Commercial printing—whether traditional offset, direct to plate, or direct from digital files—uses a combination of four process-printing colors: cyan (C), magenta (M), yellow (Y), and black (K). These four colors are combined in various percentages to make up “all colors.” Most modern office copiers or printers also operate in this mode. This color profile was born out of television and is now used on all computer screens. Colors are created by combining three colors of light: red, green, and blue. RGB files are best for creating files that will be viewed on a computer screen or used in video production. The color is represented by a series of three numbers that represent the percentages of red, green, and blue light that make up that color. Short for hexadecimal, this color profile is specifically used on websites. With today’s high resolution computer screens and fast internet, the number of colors available in this profile are practically limitless, but your design firm may want to select from a slightly smaller group of “web-safe” colors that display consistently on a wide range of monitor types. A hex color is represented by a six-digit code consisting of numbers and/or letters. Keeping track of your company’s exact colors and proper file types for different delivery methods may seem mind-boggling. Most businesses leave it to their design firm or creative agency to prepare the necessary files for their logo and other color elements, and provide them with the files and a style guide for usage. Consistent use of your corporate color palette is one of many branding techniques to help ensure that your customers make visual connection with your brand and continue to remember it.